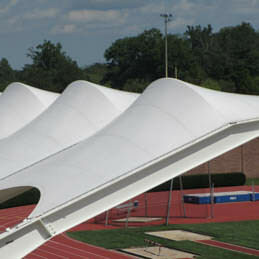 Tensile Structure Fabrics | Lightweight Manufacturing Inc.
From engineering and design, fabric selection all the way through manufacturing the final product, Lightweight Manufacturing offers all the tools and experience necessary to partner with awning companies or contractors in creating projects like these. Tensile structures will give an exciting new look for your customer’s establishment and are a highly effective way to make better use of outdoor space during the summer. Tensile canopies are designed for permanent use, and once installed they last years. They never have to be taken down, meaning your customer will get years of low-maintenance use out of their new canopy. Depending on the fabric selected, your warranty period can be as long as 25 years. Tensile structures combine pleasing aesthetics with structural efficiency, using lightweight materials in tension. 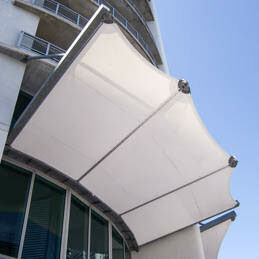 Shade structures are specifically designed to create shade by using mesh materials. Tensile structures are used for a variety of different applications: large spans are used for event spaces, grandstand covers, stage covers, public gathering spaces etc. Smaller tensile structures are used for outdoor restaurants, rooftop bars, private areas around pools and residences and any place where shade and weather protection is required while maintaining an outdoor atmosphere. Tensioned fabric facades are used for aesthetic purposes and to create a skin on a building that provides very specific climatic, energy efficiency and visual benefits. They are used successfully when remodeling an existing structure but also when building new projects, where the benefits can be even greater. Lightweight Manufacturing provides fabric panels for tensile, shade and facade projects, and can also provide the engineering and design services associated if desired. This is typically delivered through a specialized turnkey contractor for any size project, and through local awning companies, shade specialists and landscapers for smaller projects. If you are interested in offering your customers these types of projects, please fill in the form below, email us, or reach out to one of our experts at (610)435-4720.